Featured in this survey are three distinct brands of cables and interconnects: the Audience Au24 SX, Dynamic Design Titania AE15, and Morrow Audio Elite Grand Reference. To be clear, these are not budget wires. They are premium offerings designed for superior systems where resolution and transparency are already of a high order. I am not going to prolong the suspense. These cables were all crack-shots. The margins between them was relatively small in the grand scope of a fully rigged audio system. Similarities far outweighed differences, as they should in this heady range. As I’ve stated many times before, cables in this league are not meant to remake a system—only to fine-tune and polish one, to smooth out an edge or deepen a luster. They are not brute tone controls and shouldn’t be construed as such. What they will do is optimize. Based upon what I heard, differences mostly came down to small anomalies at the frequency extremes, in inner detail and focus, and contrasts in temperature or color-light shed, and light withheld. Readers often ask if I have any advice on how much of a hi-fi budget to allot to cabling. First, make sure actually to include cables in the budget. Don’t take a “let’s wait and see what’s left” approach. Keep an eye on perspective as you decide what to purchase, and hold your ground—don’t fork over five figures on cables for a four-figure system, no matter who’s doing the arm-twisting. Remember, a bespoke audio system is not built around a cable. Rather, cables are like icing on a layer cake—applied last. My advice: First get to know your overall system intimately. And then when budget allows, consider auditioning any or all of these noteworthy contenders. Set-up note: Loudspeakers I used included the Aerial Acoustic 5T, the Starke Sound IC-H3, and ATC SCM20SL and SCM19A. I also reconfirmed general observations running interconnects through the elegant, all-analog Pass Labs HPA-1 headphone amp powering Audeze LCD-X and HiFiMan Edition X headphones. 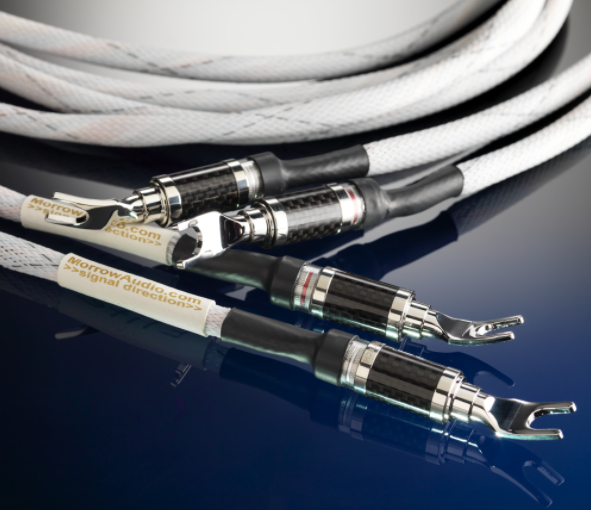 During this survey my trusty reference cables were the Synergistic Research Atmosphere Level Four loudspeaker and the (expensive but addictive) Analysis Plus Micro Golden Oval interconnects. Audience recently introduced its flagship series, the Au24 SX. As the successor to Au24 SE (reviewed in Issues 230, 249), the SX offers improvements including the use of purer copper (now six-nines) and higher-quality XLPE dielectric insulation in addition to geometry modifications. 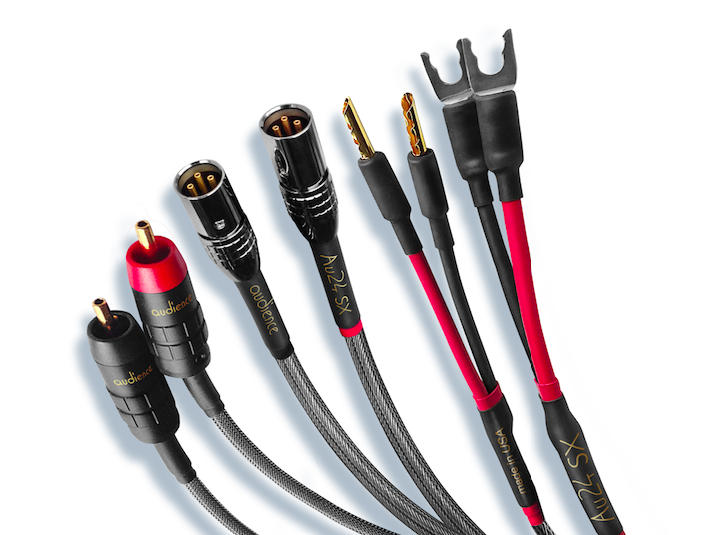 As top-tier cables go, the SX certainly doesn’t fit the role of superhero—it’s not bulging with braided wires trying to burst through thick, unwieldy jacketing. You don’t have to wrestle it to the ground and pin it beneath your feet to keep it from coiling around your ankles. Sonically the Au24 SX most closely staked out the musical middle ground. It produced a ripe midrange weight and sweetness, vivid dynamic contrasts, a sensitivity to delicate volume gradations—and ultimately, a brilliance factor that cast light into the deepest corners of the soundstage and restored air and lift to harmonics. Audience SX most approximated my own references and also seemed to be the least constricted. The image of Miles Davis’ muted trumpet from “Kind of Blue” seemed to emerge like a specter from the deep soundspace—and did so with an authority and an open voice and airy quality that were riveting. During Stravinsky’s Pulcinella, solo violin possessed the combination of harmonic openness and reverberant energy and attack that to my ears defines this instrument. Vocal sibilance was very good, capturing the natural attack of hard consonants. There was a hint of leading-edge whitening during Holly Cole’s “Jersey Girls,” however. During “Down to the River to Pray” sung by angelic vocalist Alison Krauss, the Audience tended to illuminate the outlines of instruments—a small additive that exemplifies the superb detail these cables reveal. Imaging, and particularly the air between images were noteworthy. For example during Bob Dylan’s “Lay Lady Lay” from Mobile Fidelity’s superb 45rpm reissue of Nashville Skyline there was terrific vocal depth in close proximity with percussion transients at one side of the stage, and a softly strummed acoustic guitar placed just beyond Dylan’s ear. The specificity of this musical tableau can easily be smudged, but here it was electrifying. In comparing listener perspective among these cables’ presentations, during Vaughan Williams’ “The Lark Ascending,” pianist Evgeny Kissin’s concert grand emerged a couple of orchestra rows closer with the Au24 SX—say, row E or F versus row H for the Morrow Audio, or row C for the Dynamic Designs. There was also the greater sense of proximity from the SX, a note-by-note intensity and drive. Once again, during the Elgar Enigma Variations, on Reference Recordings, the Audience SX portrayed a wider stage with finely honed delineation of the string and wind sections. During the opening bass riff of Holly Cole’s “I Can See Clearly” from Temptation, there was a cavernous, reverberant spatiality that rose and expanded to every corner of the soundspace. The other cables narrowed this background cue slightly while the Audience SX extended those reverberations. A particular strength for all these cables was the hard-to-manage blend of the transient, the tactile, and the reverberant—prime examples are the rhythmic finger-snaps during Patricia Barber’s cover of “Ode To Billie Joe” from the recently reissued SACD. The Audience cleared this bar expertly leaving no doubt that the source of these cues was of a strictly human origin. Conclusion: The Insider—The Au24 SX struck a fluid and natural balance of ease, articulation, and immersiveness. Sporting sparkling, stiff metallic jacketing in separate runs for the positive and negative conductors, Titania AE15 was nothing if not flashy. Its conductors are ultra-high-purity multi-solid core for frequency linearity and “are precision aligned for uniform impedance across the length of the cable at all frequencies.” The dielectric uses an air-impregnated multi-layer, low-loss insulation system with full-coverage EMI and RFI protection. The conductors are protected from these deleterious effects by both absorption and reflection. They are actively shielded (batteries not included) and are finished with top-notch Furutech connectors. On a purely gut level the Titania produced some of the most exciting moments in the survey. During Stravinsky’s Pulcinella ballet excerpts, its sheer dynamism, colorful tonal presence, transient speed, and bass retrieval made my ears stand at attention. The way this Argo recording (on LP) conveys the live event of Neville Marriner and his St Martin in the Fields chamber orchestra in performance makes it a personal favorite. As the musicians shifted from one theme to another, the Titania cable delivered a wealth of top-to-bottom low-level information from a nicely proportioned soundstage and captured the fullness of the ensemble with cool intelligibility. Deep cello and bass resonances were also noteworthy. This wire does have a signature, however: a controlled and clinical side that reduces some of the easy fluidity and flow from the warmth of Alison Krauss’ performance of “You’re Just a Country Boy” but this trait was easily factored in during extended listening. As a general observation its soundstage perspective was a little more proximate, a bit flat, and couldn’t quite match the dimensional qualities of my reference cable. It has a more forward lean, not exactly an “in-your-face” orientation but a character that positions the listener closer to the front rows than the other cables in this survey. It casts a cooler signature than either the Morrow or the Audience but only by a small margin. This elicited, for example, an added liveliness to solo violin that perked up the senses yet remained musically convincing. With respect to inner detail and resolution, Titania reproduced the colorful lead acoustic guitar from Patricia Barber’s cover of “A Taste of Honey” with articulation and detailed micro-dynamic contrast. Constantly evident throughout my listening sessions was the Titania’s superb bass performance. Patricia Barber’s “Ode to Billie Joe” from Café Blue Un-Mastered [Premonition] has a superbly defined upright bass that serves as the weight and foundation for the spare arrangement; only rhythmic finger snaps are added. The Titania produced stunning transient attack off the bass strings and seemed to add a bit more lift and energy behind the vocal, as if urging the singer forward a step a two. On the Elgar Enigma Variations, a title from Reference Recordings [Stern: RR-129] of superb spaciousness, the Titania tracked the organ entrance with vigor and precision. It also presented the micro-gradations of volume and transient attack from the wind section with a sense of potency— even majesty—that was exceptional. Conclusion: The Extrovert—Titania conveyed a more forward, cooler sound but it proved electrifying in its presence, dynamic energy, and bass response. When I reviewed the mid-priced Morrow Audio SP7 Grand Reference speaker and MA7 interconnects (Issue 259) little did I know that lurking on the horizon was a no-holds-barred flagship model from Morrow. Enter the Elite Grand Reference wire—the brand’s recent top-tier offering. (Actually, nearing press time Morrow announced the introduction of its new flagship 10-Year Anniversary Series, but we’ll leave that for another day.) Common to all Morrow cabling, is its SSI design philosophy, which stands for solid-core, small-gauge, individually insulated. 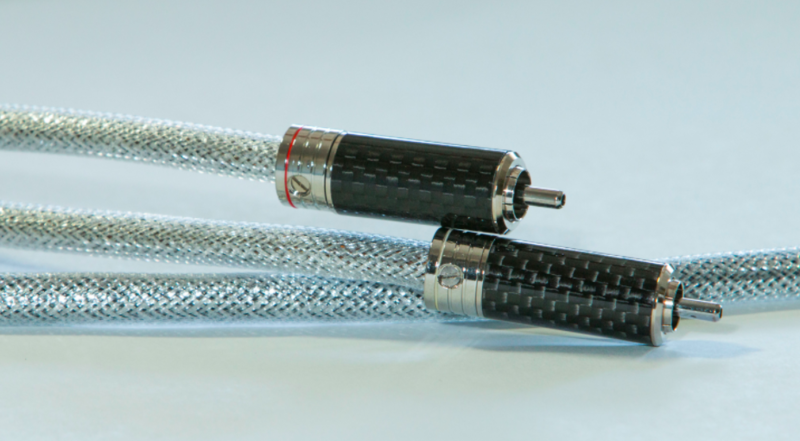 For the Elite speaker cable, that translates to 192 runs per cable of SSI wiring consisting of solid-core, small-gauge, silver-coated copper wire that is silver-soldered, dressed in a white nylon mesh jacket (black is also available) , and then joined to classy Furutech terminations. The cables use separate runs for the positive and negative signals and are extremely flexible and easily managed. Sonically the Elite was the great, unpretentious communicator. A balanced, smooth, and honest presentation was its calling card. Throughout the survey I returned to the observation that the Elite was the most forgiving and relaxed wire in this survey. It projected a calm sense of civility that made me want to sink into the sound and luxuriate. While the Audience and the Dynamic Design tended to behave with a extra level of micro-intensity during the Reference Recordings of The Wasps Overture, the Morrow took a slightly more reserved tack, one that was less focused on punching up image details, and more committed to conveying the wider continuity of the symphonic experience, ambience and all. But that’s not to imply the Elite was any sort of wallflower. During Jen Chapin’s “Renewable” the Morrow communicated excellent bass extension, attack, and punch. Her quirky vocal on “Higher Ground” was a winning balance of warmth and clarity. And perhaps most of all, the duet for bass and trombone during Pulcinella was frothy with resonances and transient attack. There were times when I felt that the Morrow Elite placed a slightly added emphasis on the treble range—a hint of brilliance topping orchestral strings, or a wisp of top-end air elevating wind and brass sections—but this was hardly a disqualifying distraction. In determining the relationship between imaging and immersion, I use Alison Krauss’ “Down to the River to Pray” where, led by Krauss’ vocal, a chorus of layered voices enters and builds in energy with each progressive verse. The Morrow reproduces the effect as a softer, more diffuse halo of voices, giving warmer emphasis to the group as a collective sound and a bit less to the individual detail that marks and outlines each singer. Mind you, in terms of imaging, if the Audience Au24 SX was committed to placement specificity, the Morrow Elite opted for a more diffuse interplay of images. For many of us, a worthy tradeoff. This is all due in part to stage perspective. During Vaughan Williams “The Lark Ascending” for example, I found myself seated roughly mid-orchestra, positioned just a little further back than with the other references. Consistent with this observation was a soundstage that narrowed slightly during Holly Cole’s “Jersey Girls,” where the backing chorus, which typically hugs the left channel, moved a couple paces to the right, but this was a minor subtraction at best. Conclusion: The Communicator—Understated but deceptively transparent, the Elite Grand Reference conveyed a sensitive blend of spaciousness and dimensionality.